For all the horror that the Juno soundtrack was wrought upon the world, it’s also done an ounce of good. The bad comes first. Yes, we should hate this particular shiny disc for tricking a bunch of tweens into thinking that cool kids listen to cutesy Kimya Dawson songs. Not only is that crass, it’s mean-spirited. But like I said, this album doesn’t constitute a total net loss for humanity. 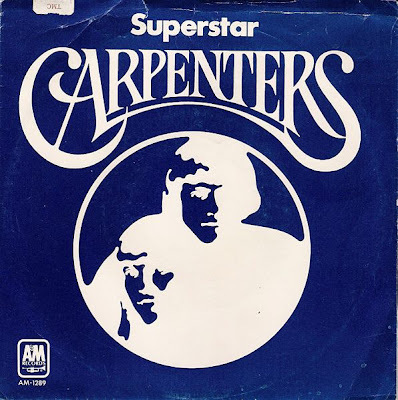 Its inclusion of the Sonic Youth cover of “Superstar” prompted me to seek out the version by The Carpenters, which I feel like I haven’t heard since early childhood, when riding in my mother’s car meant listening to the mellow 70s hits of KBAY, 100.3 FM. Literally, our every trip to the grocery store was scored with the likes of “Muskrat Love,” “Midnight at the Oasis,” or the Hill Street Blues theme. Eventually, KBAY switched formats and these songs faded from my memory. I don’t think my mom even listens to them anymore. She should, though, because ones like “Superstar” help me appreciate the value of pop music and even make me expect more from what’s popular today. In short, I feel like The Carpenters should never have recorded their take on “Superstar” at the point in their career that they did. They’d already scored hits with “Close to You” and “For All We Know,” cementing their status as full-on music stars, and “Superstar” has the unique quality of being written from the point of view of the fan — not the singer. That a person whose musical prowess had allowed them even a modicum of fame could still identify with the common man is notable in itself. The fact that they could and would sing a song about it demands attention. Whatever might have been running through the head of either Carpenter sibling regarding the song’s meaning, their “Superstar” makes me like them more and reminds me how sad it is that Karen died. Considering The Carpenters’ popularity at the time, they would have had every reason not to give a damn about the people who listened to their music. (Musicians have acted like pricks with far less right to do so.) Instead, they made a good song better, more important. “Superstar” implies an awareness of how deeply a fan’s feelings can run. It’s empathetic. It’s respectful. It’s downright human. I like this song. I like listening to it, but I also like that “Superstar” — a played-out, mainstream success that, in certain contexts, could be considered trite and sappy — can still move me to the point where I’d feel comfortable expressing admiration for it. It’s everything a pop song should be. (Hell, it even contains the lyric “Baby, baby, baby, baby, baby.”) And yet it manages to elevate itself beyond typical pop fodder. That must be it. Why else should my heart break a little each time I hear those opening harp strings?